Grace and peace in the Lord Jesus Christ. I'm writing to you this morning from Rockville, Maryland after seven days of being on the road, having already been blessed by the numerable experiences thus far; of the places we've been and people we've met, all of which I give thanks to God. 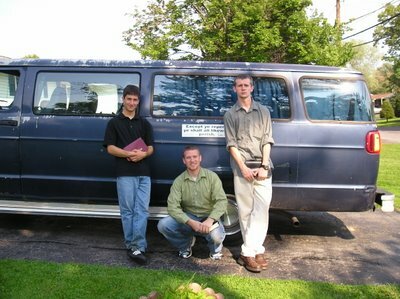 The picture you see above is our team, from left to right: myself, Miles and Evan, and the van behind us is our home for the next while. The Lord has indeed blessed us with a tremendous team; the van is more than we could have asked, very spacious and comfortable, but what's more is how we as brothers have bonded wonderfully, having loving affection towards one another with a united mind in seeking the glory of our great God and Savior. Praise God! This update will have to be brief as we are about to head out and preach day two at George Mason University in Fairfax, Virginia. I'll be posting an update on GMU in another post. 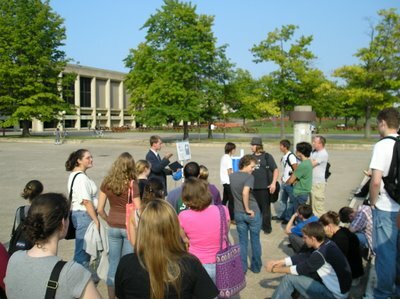 Last week we preached three days in New York State at SUNY Oswego and had amazing open air meetings, preaching the gospel of Christ to mostly civil, eager to learn students. Three classes even left their classrooms to come outside and hear us! The joy of it all is exalting Jesus Christ publicly to the unbelieving world, strengthening and encouraging the Christian body on campus, and preaching repentance and remission by the cross of Jesus Christ which is the power of God unto salvation. God is truly fulfilling the desire of my heart. Praise God brother Eli, Miles and Evan. Very encouraging to hear the reports. keep preaching the word of God faithfully and with "meekness" saving some. I believe God is going to give you brothers good fruit. I will be in touch brother, stay faithful to him. Miss you man! Watched the video, you look alive and well : ) Keep it up man, universities need it. If you need me to do any research for you on anything (inspiration of the word) at all, let me know and I'll email it to you. It's absolutely fascination how the word of God shuts up so many arguments. I run into two questions all the time and I'm working on some research for them. "How do you know God wrote the bible?" and "How can you prove the bible's authenticity?". Greg, bless you brother! Good to hear from you and I pray all is well with you and the school. Lord willing we'll get in touch really shortly. Good to hear from you brother! Pray all is well with you and Katie. 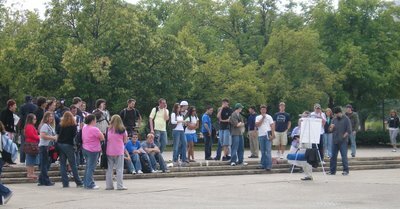 Preaching on the campuses is a lot more intense and intellectually stimulating than at the Farmer's Market :). I try as little to argue with the students evidentially, ie. proof from history, nature, prophecy, until first arguing presuppositionally, getting to the foundation of their thinking. "The fear of God is the beginning of knowledge." (Proverbs 1:7) Knowledge doesn't bring you to God... God brings you to knowledge. We hold to the argument of the impossibility of the contrary. Bless you brother. Look high, stay low.